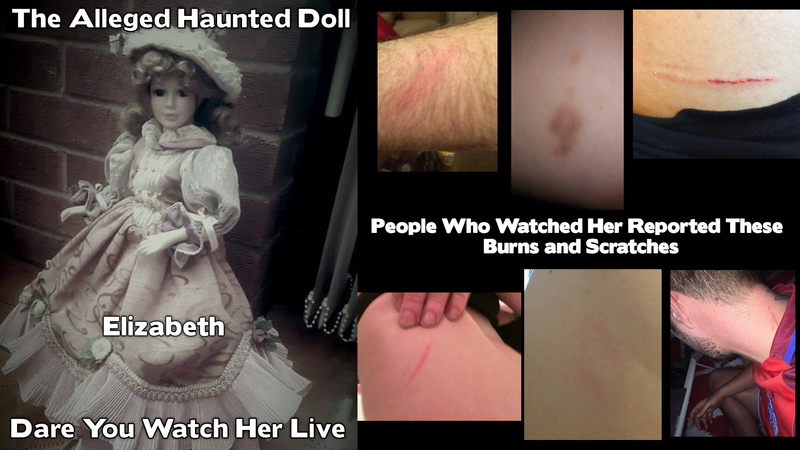 Welcome To the Official Page For Elizabeth The Haunted Doll In Uk?? Who Will She Attack Next? Best Evidence Of Elizabeth The Alleged Haunted Doll: Does This Show The Spirit Attached To The Doll Talking And Causing unusual Paranormal Activity? Part 2 Coming Soon.. Which Shows Possibly Shows Elizabeth Pushing The Crying Boy Painting?? This doll is called Ruby but a Spirit By the name of Elizabeth is alleged to have an attachment to the Victorian doll, its believed she doesn’t like men, and has quite a temper on her. There is also believed to be a male spirit present which is believed to control Elizabeth. This page will follow the journey of Elizabeth listing the Reports as they happen, and all the case study’s regarding this alleged haunted item. 2 Fans Watching the LIVE case Study 2 Started to Burn Up. Lee Revealed the doll was called ruby and Echovox Said Ruby at the same time. Viewers Reported Shadows Around Lee. The Crying Boy Painting which the show was focused about what thrown to the floor??? Live Viewer Asked for Elizabeth to come and show them a sign… This is what she got..
Case Study 4: Lee Steer Pushes himself on the spirit alleged to be in the doll, attempting to make her angry, the chat explodes with people reporting Cuts, and Burses and burns..
Ross Reports A Nasty Burn..
Live Stream Investigation 11/09/2016 “focused on the crying boy, but Elizabeth made herself known??? was she mad because the attention wasn’t on her? Live Case Study 4 – THE ATTACKS Increase… ?? ?